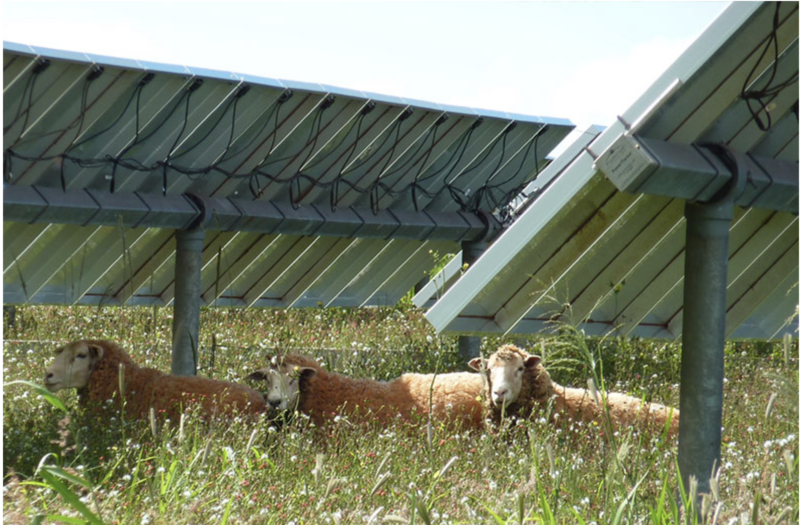 Solar panels could increase productivity on pastures that are not irrigated and even water-stressed, a new study finds. The new study published in PLOS One by researchers at Oregon State College finds that grasses and plants flourish in the shade underneath solar panels because of a significant change in moisture. The results bolster the argument for agrovoltaics, the concept of using the same area of land for solar arrays and farming. The idea is to grow food and produce clean energy at the same time. Tests of the agrovoltaics concept are now underway at several spots around the world. Researchers behind these large-scale experiments are testing whether crops can grow just as prolifically in the shade of solar panels as they would under full sun, and are figuring out the best solar panel tilt and arrangements. The OSU team happened upon their findings by accident. Walking past one of the solar arrays on campus one day, biological and ecological engineering professor Chad Higgins saw that green grass was growing in the array’s shade. So they installed instruments to measure air temperature, relative humidity, wind speeds, and soil moisture in the areas under panels and under direct sunlight. They conducted these measurements between May and August of 2015. At the end of that period, they also weighed the above-ground biomass in the different areas. They found that areas under the solar panels had a different microclimate than exposed areas. Shaded areas were 328 percent more water efficient, and maintained higher soil moisture throughout the heat of summer. That led to twice as much grass under the arrays as in the unshaded areas. The plants also had more nutritional value. And the researchers also found a 90 percent increase in late-season plant mass in areas under PV panels. Source: Elnaz Hassanpour Adeh, John S. Selker, Chad W. Higgins. Remarkable agrivoltaic influence on soil moisture, micrometeorology and water-use efficiency. PLOS One, 2018. Power demands are set to increase by two-fold within the current century and a high fraction of that demand should be met by carbon free sources. Among the renewable energies, solar energy is among the fastest growing; therefore, a comprehensive and accurate design methodology for solar systems and how they interact with the local environment is vital. This paper addresses the environmental effects of solar panels on an unirrigated pasture that often experiences water stress. Changes to the microclimatology, soil moisture, water usage, and biomass productivity due to the presence of solar panels were quantified. The goal of this study was to show that the impacts of these factors should be considered in designing the solar farms to take advantage of potential net gains in agricultural and power production. Microclimatological stations were placed in the Rabbit Hills agrivoltaic solar arrays, located in Oregon State campus, two years after the solar array was installed. Soil moisture was quantified using neutron probe readings. Significant differences in mean air temperature, relative humidity, wind speed, wind direction, and soil moisture were observed. Areas under PV solar panels maintained higher soil moisture throughout the period of observation. A significant increase in late season biomass was also observed for areas under the PV panels (90% more biomass), and areas under PV panels were significantly more water efficient (328% more efficient). Statewide snowpack basin-filled map January 13, 2019 via the NRCS. Statewide Basin High/Low graph January 13, 2019 via the NRCS. Upper Colorado River Basin High/Low graph January 13, 2019 via the NRCS. Gunnison River Basin High/Low graph January 13, 2019 via the NRCS. Laramie and North Platte Basin High/Low graph January 13, 2019 via the NRCS. Upper Rio Grande River Basin High/Low graph January 13, 2019 via the NRCS. San Miguel, Dolores, Animas, and San Juan Basin High/Low graph January 13, 2019 via the NRCS. South Platte River Basin High/Low graph January 14, 2019 via the NRCS. Yampa and White Basin High/Low graph January 13, 2019 via the NRCS. Arkansas River Basin High/Low graph January 13, 2019 via the NRCS. And here is a screen shot from the interactive SNOTEL map from January 14, 2019. 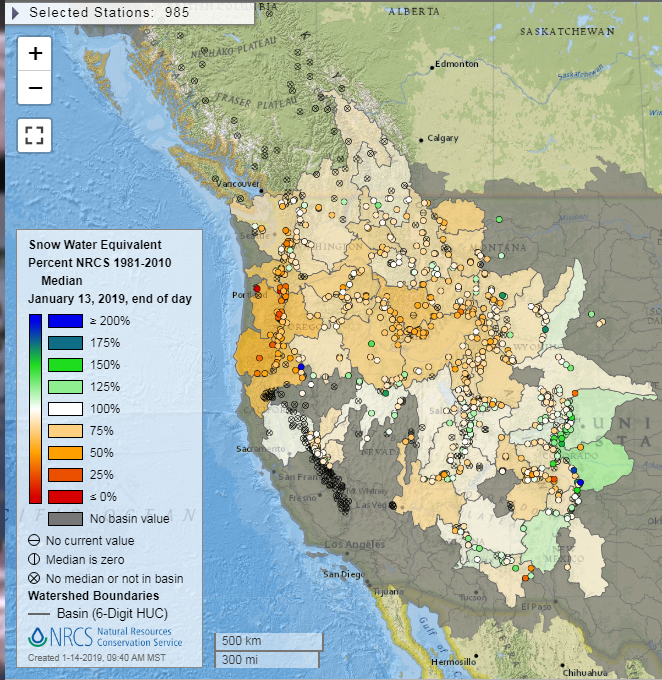 Interactive SNOTEL map screen shot January 14, 2019 via the NRCS. 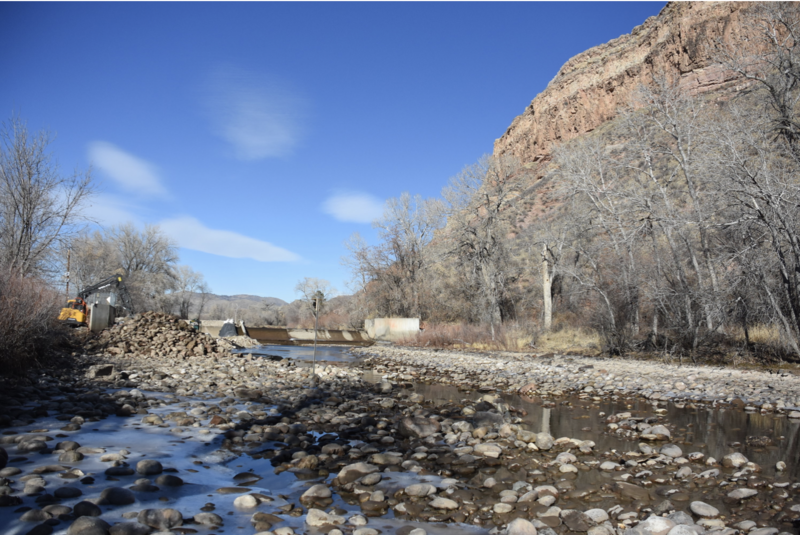 [In December 2018] a project [broke ground] that will help reconnect a fragmented Poudre River. 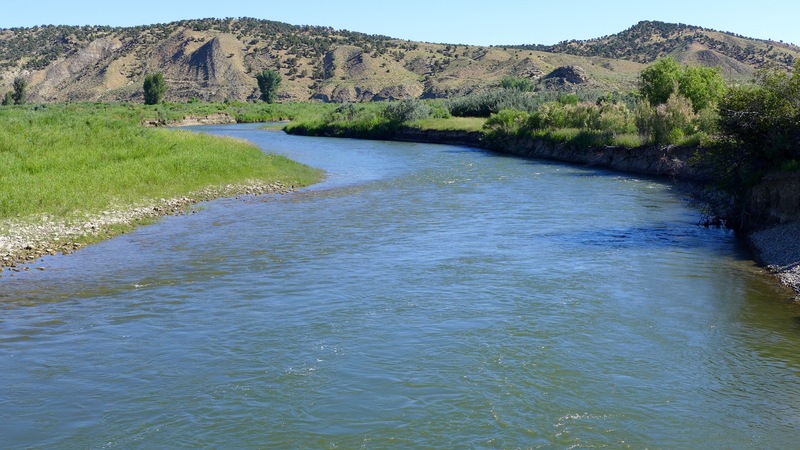 In a collaborative effort, Morning Fresh Dairy, Northern Water and noosa yoghurt are partnering with Colorado Parks and Wildlife (CPW) to put in a fish ladder at the Watson Lake Diversion. They hope this will be one of many ladders along the Poudre River that will allow fish to travel freely, improving the health of the fishery and the ecosystem. This Watson Lake fish ladder will reconnect over two river miles. The stretch contains important spawning habitat and deep pools that provide refuge for aquatic life. Watson Lake Diversion Structure is a channel spanning structure that represents a complete barrier to all upstream fish movement in the Poudre River. The structure delivers water to Watson State Fish Hatchery and is owned and operated by CPW. Designed by OneFish Engineering, the fish ladder will provide upstream fish movement through the diversion structure for all species present within the river reach including longnose dace, longnose suckers, white suckers, brown trout and rainbow trout. 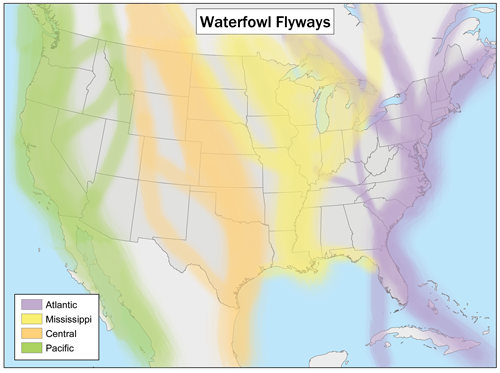 The State Wildlife Area and Hatchery, where this project is located, receives a lot of visitors whether they are fishermen, birders, or families enjoying nature. Onsite educational material discussing fish passage will be an important component of the project providing a learning experience for school children and all other visitors. The new fish ladder also fulfills one of the promises made by the participants of the Northern Integrated Supply Project to improve the Poudre River, outlined in the NISP Fish and Wildlife Mitigation and Enhancement Plan. 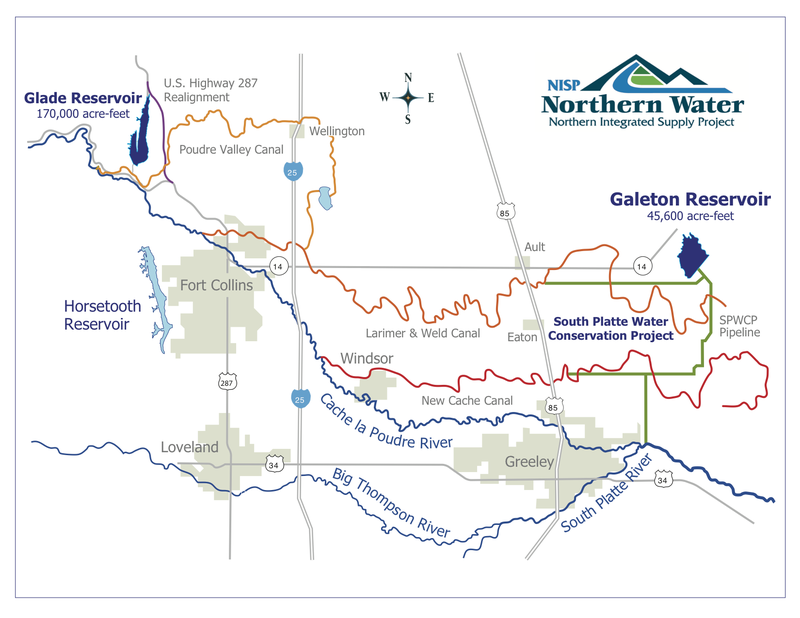 The project started in December 2018 and will be completed in March 2019 before spring runoff begins on the Poudre River. One of the goals is to help move other fish passage projects forward on the Poudre River. Local ditch companies will be able to observe one of these projects first-hand and see that there is no negative impact to water delivery. This will be an important resource to move fish passage initiatives forward with other diversion structures.